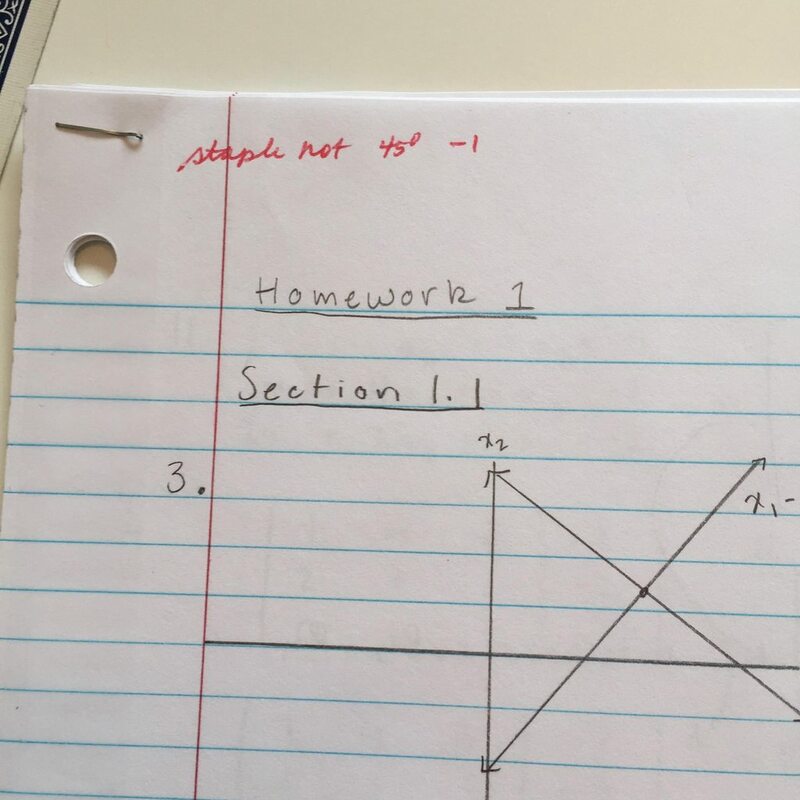 I had to laugh when I opened the picture from an internet posting http://i.imgur.com/aPUXFMbh.jpg that showed the math homework of a student who got every problem correct but lost a point on the final grade because the staple used was not placed at a 45 degree angle. We all had teachers like that. One of my college professors would throw assignments in the trash if he found a misspelled word. I had a middle school teacher who would stop class if he saw a piece of trash on his classroom floor. Until today I had never heard of the 45 degree rule when it comes to staples. I guess it might have had something to do with it being a geometry assignment! Can you imagine what that student must have felt like? Math is hard enough as it is, but to get every problem right and fall one point short of 100 because you did not place the staple correctly?? It reminds me of what the Bible says about perfection and our inability to measure up to the perfect standards of God. Matthew 5:48 Jesus tells us to show perfection in the way we treat others, just as God is perfect. Paul tells us in Romans 3:23 “All have sinned and fall short of the glory of God.” We have missed the mark that God has set for us. No matter how good you are or how well studied you might be in the Bible God requires 100 percent and 99 might be close but you are as far from the mark as someone who made a 50! I am reminded of the rich young man that came to Jesus and asked the question of what one need to do to inherit eternal life. Jesus listed a few rules the Bible talks about, which the man replied he had kept. Jesus then asks him to sell everything and follow after Him. At that the man went away sad because he could not let go of his wealth. What keeps you for hitting the mark? The Bible is very clear that we can do nothing to win our own salvation. Only through Jesus can we be saved. Today, pray for ways you can encourage others through your life testimony. None of us is perfect, but we can show the perfect love of Jesus in the way we treat one another!